Immediately prior to the introduction of identity discs into the British Army, individual identification was satisfied by the issue of a printed identity card which remained in the possession of the soldier while in service. This card, (Army Form B 2067) was surrendered when the soldier entered into the Reserves, with the intent of re-issue should the soldier be called back to active service. Needless to say, the card itself suffered the typical hardships of rough use and was often indecipherable when needed to identify its owner. 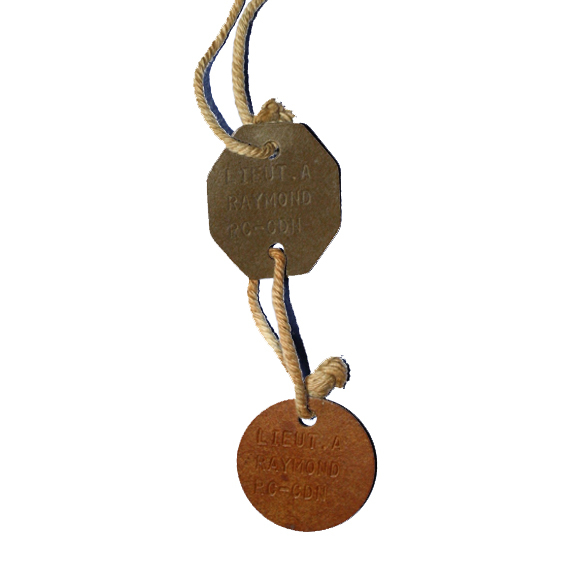 The first mention of identity discs appears in January, 1907 when a single aluminum disc, fitted with a 42 inch cord, was approved for use on mobilization. Instructions stated that the discs were to be kept ready marked, showing the soldier’s number, name, rank, regiment and religion. The use of the soldier’s rank on the disc required that a new disc be issued with every promotion. The marking of the disc was to be done locally and units were to indent for 1/8 inch steel stamps. The orders do not state either the religions or the approved abbreviations which could be used. 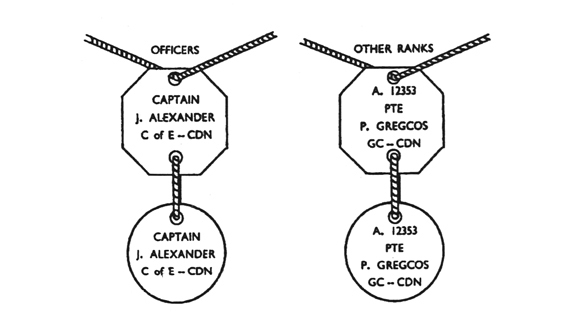 By May, 1907 an amendment addressed the use of the soldiers rank on the discs by removing the requirement. The illustrated sample also did away with the smaller scripted letters for the abbreviation to regiment. 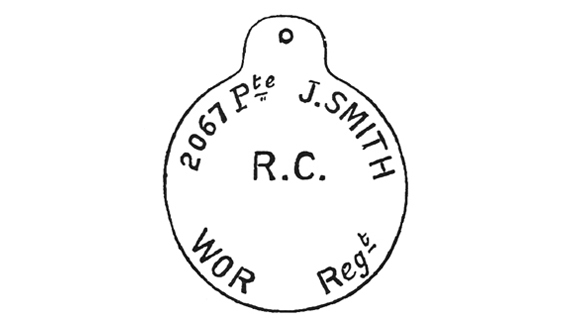 The second pattern ID disc disposed of the rank as well as the smaller characters for both rank and Regiment – which required a second set of smaller stamps. 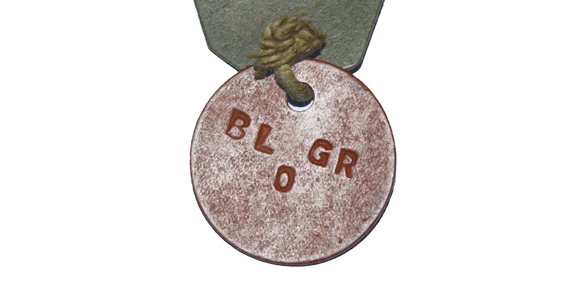 A further amendment, introduced in April, 1908 allowed for the discs to be stored with the regiment’s name already stamped. The soldier’s name, number and religion would be added upon mobilization. At some point, near the beginning of World War 1, the disc, previously manufactured in aluminum, was replaced with a red disc. This disc was manufactured of a non-ferrous, fibre compound which resembled linoleum. The marking of the discs in Canada was identical to that of Great Britain, with the addition of the word ‘CANADIANS’ or the abbreviation ‘CDN’. It is not unusual to find the discs marked with the information equally divided between the two sides. The identity disc remained unchanged until 1916 when it was decided by the War Office that a disc should remain with the remains while a second disc was removed and used in the computation of battle fatalities. Until the Great War, the remains of soldiers killed on active duty could be buried in situ, or removed to a central burial site by the Regiment. With the static warfare of the trenches and the requirement to move the remains to a central burial ground, the introduction of a second disc was a logical step. 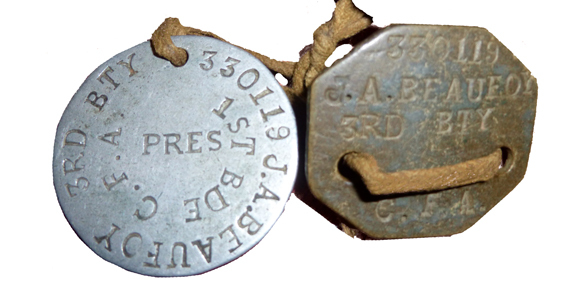 Army Order 3287, of April, 1916 instructed that each officer and soldier would be issued two identity discs. 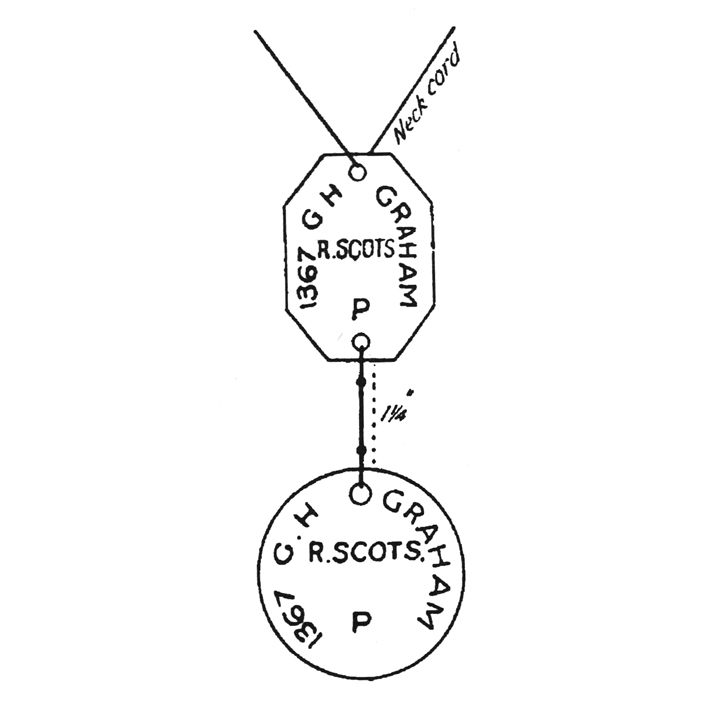 The upper, octagonal, disc was to be known as “Disc, Identity, No.1, Green” and was to be worn around the neck. The second, “Disc, Identity, No. 2, Red” was then suspended from the first. By the end of the First World War soldiers were issued with two discs – one of which remained with the body in case of death. The upper disc, known as “Disc, identity, No.1, green” will not be removed but will be buried with the body. Consequently, in cases where a body can be reached and identified but cannot be brought back for burial, the lower disc will be removed, to ensure proper notification of death, while the upper disc will remain as a safeguard against loss of identity when it becomes possible to bury. 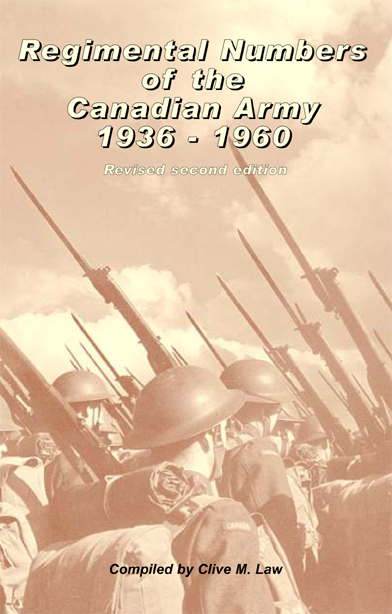 The status of the identity discs remained virtually unchanged until World War 2 when Routine Order #29 for the Canadian Army Active Service Force outlined the procedure to be used. This procedure called for the discs to be issued by the local District and that they be in the possession of the men and officers before they leave the District to proceed overseas. The style used throughout the Second World War. Routine Orders allowed for a number of additional religious denominations to be inscribed. In August, 1943, the Army Technical Development Board (ATDB) undertook a project to develop new identity discs on behalf of the Director of Ordnance Services (DOS). This project, number 1032, included the National Research Centre (NRC), the Royal Canadian Air Force and the Royal Canadian Navy. Minutes of the project show that $50.00 was set aside to cover incidental expenses during the course of the project. The purpose of the project was to develop an improved disc with a greater resistance to heat and corrosion. At the same time, General Service (GS) requirements called for a disc that was lightweight and readily embossable. In August, 1943, the NRC had developed a material which was readily embossed, had a much lower moisture absorption point than the current disc and which could withstand a heat treatment of 1200°F for a period of three hours, with no loss of legibility. It was also found that temperatures could rise to 2500-3000°F for relatively short periods, did not break down the material. As promising as this appeared, samples submitted by the manufacturer in September, 1943 were not completely satisfactory and new samples were ordered to be issued two discs, one of which was to remain with the body. subjected to tests. These were received in November and, when tested, were found to meet all of the requirements, except that the outer laminations were found to contain too much resin. Meanwhile, it was thought that stainless steel discs would be the ideal substitute. 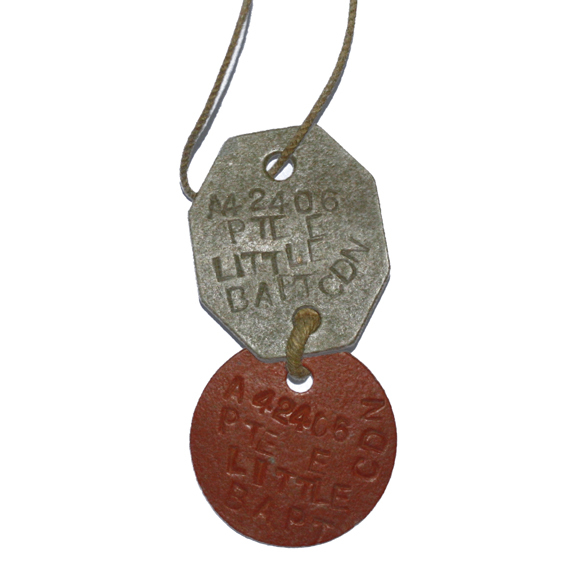 Rear view of Pte Little’s red disc. The inclusion of a blood group is unusual. Australia had advised Canada that they had been using them from the start of 1943. Australia had also examined the use of zinc as a replacement but found that zinc was subject to corrosion in the jungle. Canadian authorities also rejected zinc because of its properties – zinc melts at 786°F, whereas temperatures in a burning tank or aircraft can reach 1100-1300°F. Samples of stainless steel were ordered from a US manufacturer. These were found to be too hard to permit ready embossing with the current equipment. In December, 1943, it was suggested that a 13/4 inch stainless disc could be recycled from the eyepieces of old respirators. 100 stamped samples were made up but, again, difficulty was encountered in embossing these. By February, 1944 samples of a new plastic material were received from a Canadian contractor and when tested by the NRC showed definite failure to withstand extreme heat. Notwithstanding this failure, a sample of the plastic discs and of the US stainless steel discs were sent to the Department of Munitions & Supply with the request for information as to the availability of stamping machines in Canada, and a request that a quantity of both stainless steel and monel metal discs be supplied for further trials. While these trials were continuing, an investigation was being carried out to ascertain whether or not a design of disc similar to the German disc should be adopted. In August, 1944 the ATDB brought the question of improved discs before the Dress & Clothing Committee who decided that the NRC should continue development of the one-piece monel metal disc similar to the German disc and of sufficient thickness to withstand stamping by existing equipment. The project was given an added impetus by the urgent request of the Canadian Military Headquarters (CMHQ) in London, for 600,000 monel metal discs with stainless steel bead chains. A drawback to the steel bead chain was a US report that the Japanese had a tendency of stripping these from the bodies. This left the corpse without any identification at all. In answer to this the British War Office suggested the use of nylon or plastic cords. Canada chose not to follow this suggestion and continued development of the discs using the steel bead chain. By September the newly developed monel metal disc, after the design of the German type identity disc, was submitted along with a modified stamping machine, for the approval of the Director, Ordnance Stores. This approval was readily given and the discs were forwarded to the Dress & Clothing Committee to obtain final blessing. Before this body could take any action, the discs and specifications were passed to the Director General Medical Services for further investigation. Upon approval by that branch it was found necessary to pass the discs to the Quartermaster General, the Adjutant General and the Chief of the General Staff, each of whom also gave their support to the new design. Finally, in January 1945, provisioning action was taken to supply 100,000 of these discs for the Canadian Army and the ATDB considered project 1032 closed as of 26 January, 1945. The new design was issued in time for the Special Service Force which saw action in Korea. Again the basic information was provided on the discs, along with a serial number which, instead of identifying the unit as it did in World War II, identified the Military District in which the soldier was recruited. For the first time also, officers were allotted serial numbers. At unification a decision was made to use the soldiers Social Insurance Number (SIN) as his military serial number. This was continued until the early 1990s when it was decided that this policy encroached on a soldier’s right to privacy and on his human rights. 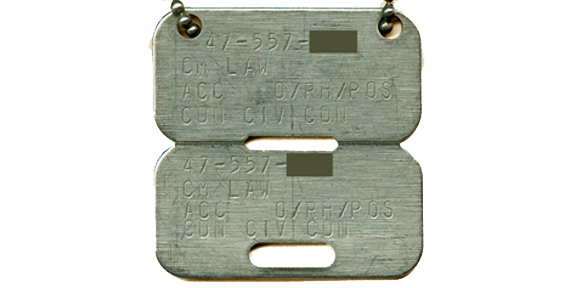 Since the mid-1990s the CF has reverted to unique numbers, known as Personal Records Identifier, (PRI) which are, in turn, used on the soldiers’ identity disc. The current discs can also display one of 18 religious options. CF pattern disc issued by the RCMP to Canadian poice officers deployed on overseas police missions. 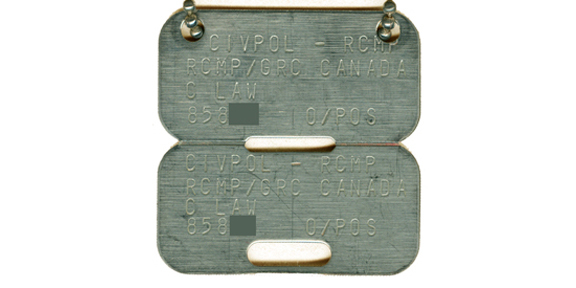 This disc is to a civilian Public Servant and in lieu of an RCMP Regimental Number, the employees personnel number is used. Note that, by policy, no religion is included on this ‘CIVPOL’ disc. You can rate this article by clicking on the stars, below. You can also scroll to the bottom of the page and leave a comment. 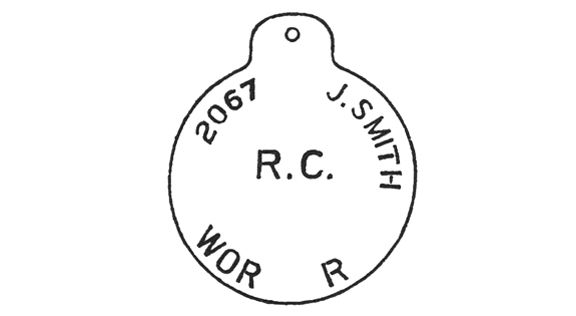 A listing of Regimental numbers used on identity discs from 1936 to 1960. Available from Service Publications.